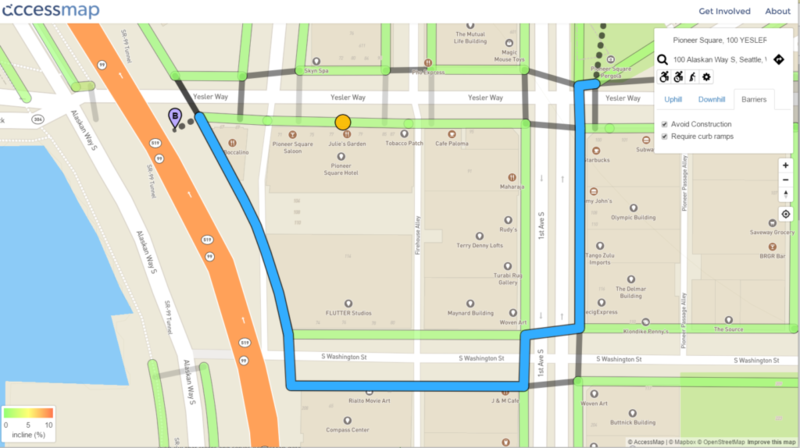 The Data Science for Social Good (DSSG) team, a group out of the University of Washington, has been involved in an effort to improve mapping of the pedestrian way. 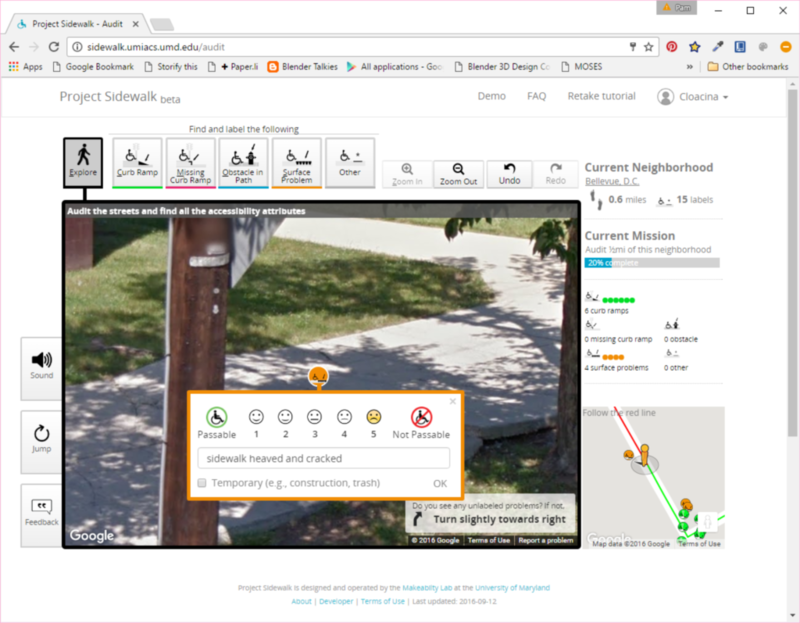 By making use of the work from the OpenSidewalks project, they created AccessMap – a trip planning tool for people with limited mobility. 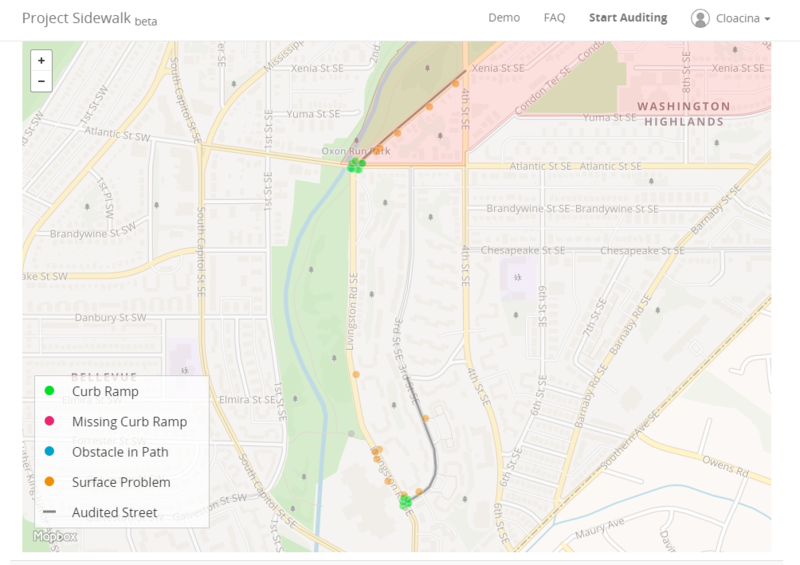 With this tool, people can find the most accessible path through a network of sidewalks connected by curb ramps and street crossings. 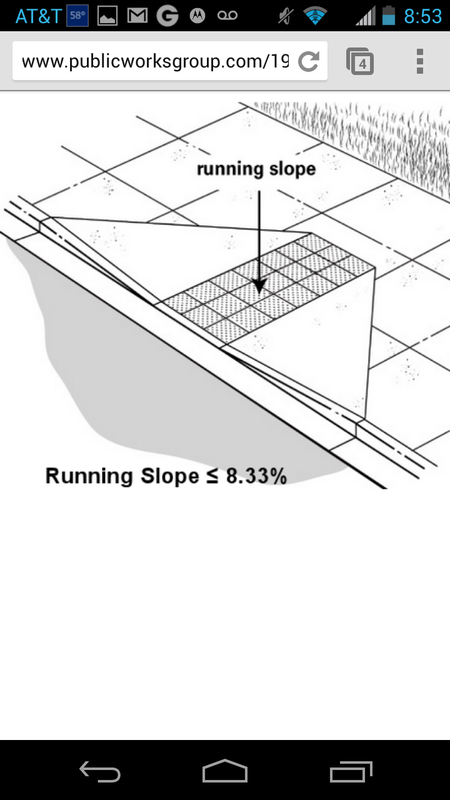 When a user clicks a sidewalk segment, the steepness or grade is displayed. 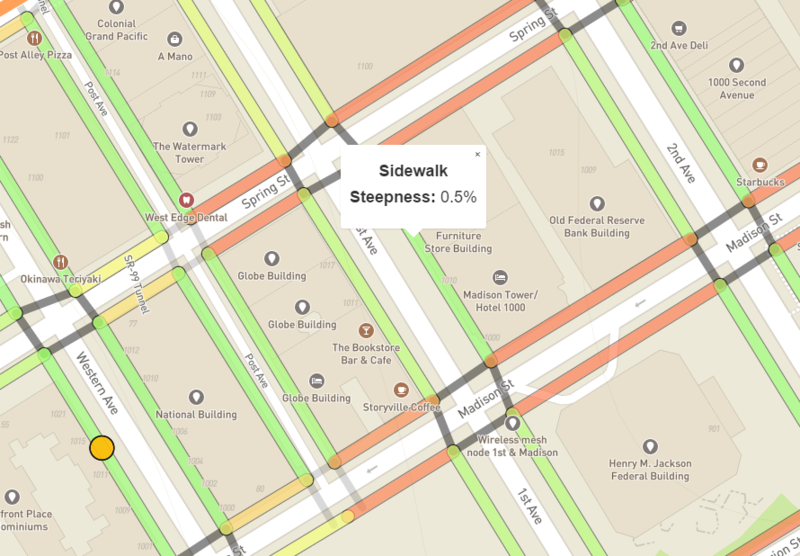 The screenshot of the map above shows a sidewalk segment along 1st Avenue between Madison and Spring streets at a 0.5% grade. Sidewalk segments are also colored coded to indicate the grade with red exceeding the required 5%, yellow just below the requirement, and green meeting the requirement. Clicking a street crossing or crosswalk displays the steepness or running grade along with a "Yes" or "No" to indicate whether or not curb ramps are at the corners. 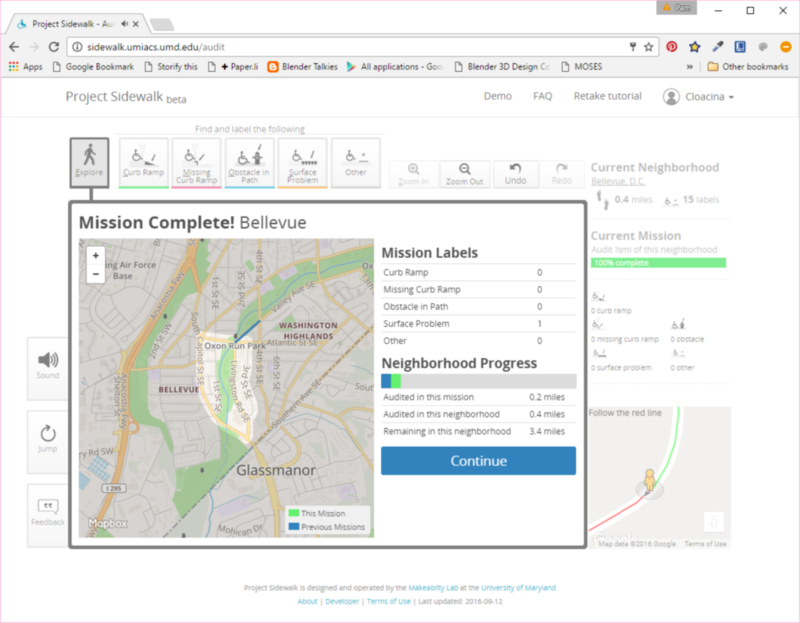 To plan a route using the map, the user types in their origin and destination in a manner similar to how other mapping programs work. 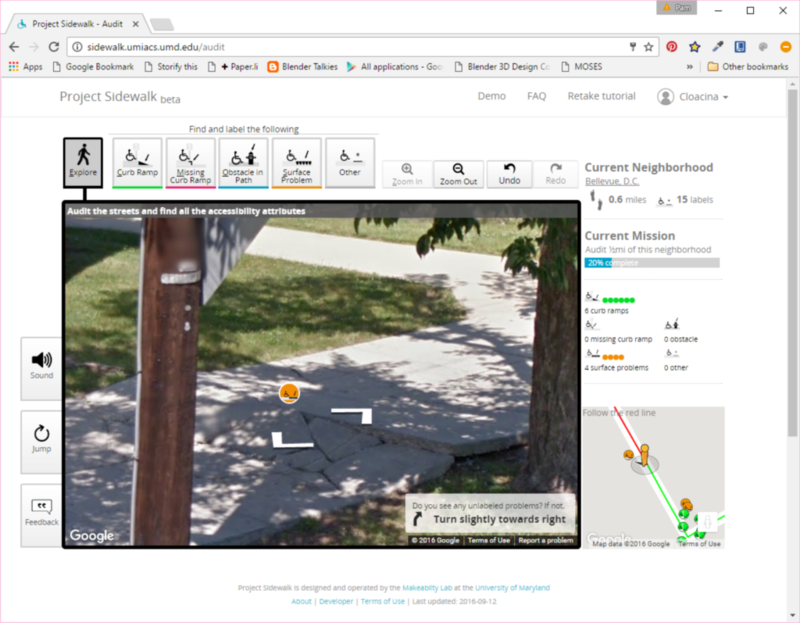 The difference is that Accessmap has a drop down tool for the user to designate a limit for maximum uphill and downhill grade and the need to avoid construction and require curb ramps. Different mobility assisted devices such as wheelchairs or canes can also be designated. Below is an example of a planned route. The Makeability Lab at the University of Maryland is on a mission to "collect street-level accessibility information from every street in the world and enable design and development of a novel set of location-based technologies for accessibility." 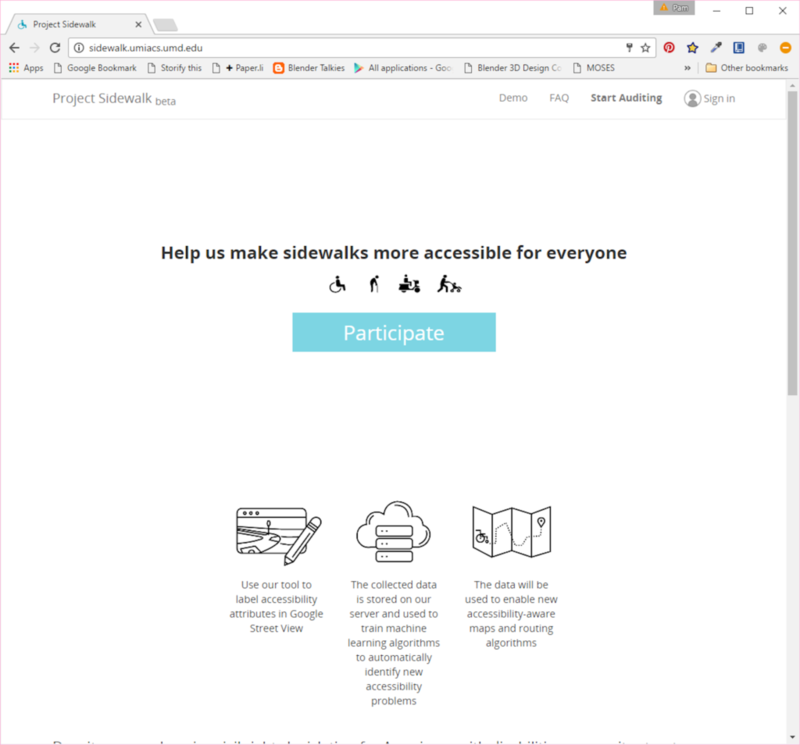 In order to achieve this goal, they set up an interactive website where people can inspect, identify, and label accessibility issues along sidewalks and at curb ramps. The accessibility issues generated by this site are fairly basic, but would still be very helpful to cities interested in quickly and easily identifying issues. 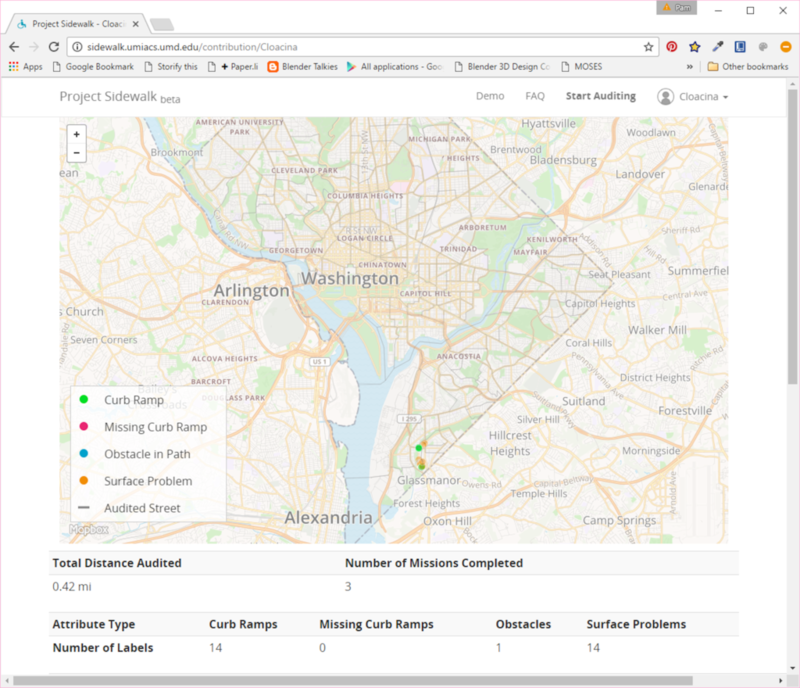 Currently the site is focused on auditing infrastructure in the Washington, D.C. area. The group also plans to use the inspection data collected to "create new types of map-based accessibility tools, such as AccessScore, an interactive map of a city's accessibility, and RouteAssist, personalized routing algorithms based on a user's reported mobility level." In addition, they are using the labels people assign to issues to develop algorithms to allow the computer to automatically find accessibility issues in the future. So far 218 people have inspected almost 400 miles or 37% of Washington, D.C. If you are interested in volunteering your efforts, you can visit their website at http://sidewalk.umiacs.umd.edu and click on the "Participate" button. Before beginning, you'll be offered a quick tutorial. You can also create an account to track your contributions. Here are a few screenshots taken while I inspected about a half mile of sidewalk in the Bellevue neighborhood of Washington, D.C. The first shows a section of heaved and cracked sidewalk I labeled as a surface problem. You can see I was able to choose this option from the group of issue icons located above the street-view image. When you place an icon on the image, a box pops up as shown in the screenshot below to allow you to choose the severity of the problem. The site gives some guidance on this, but there is still a lot of judgment in assigning a rating. 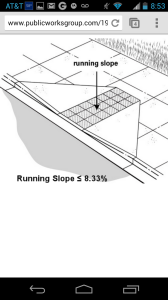 Initially I wasn't going to give this specific problem the worst rating, but then decided the slope looks severe enough I don't think a wheelchair would safely navigate across the heaved section. Below the rating, there is a space for a more detailed description of the problem. As you can see on my dashboard, the locations of the problems I found are displayed on a map. A zoomed in view of this is shown below. I was not sure if there was a way to see everyone's contributions, but if so, this would be very helpful to a city engineering or public works department in managing their sidewalk or street repair program. It would also be helpful if the data could be extracted from a given area so it could be overlaid in a city's GIS with other data such as land use, destinations such as schools and hospitals, and locations of capital improvements and developments. Because the site is so easy to use, cities could also partner with schools and ask students to participate in inspections. This would help to engage students in their community and build awareness of the needs for and barriers to accessibility. From what I can tell, the group also has the code for the site over on GitHub. Their license grants permission to make use of the software according the terms specified, and instructions for setting up your own development site are provided in a README file. You can follow the group's progress through their Twitter feed: @umd_sidewalk. 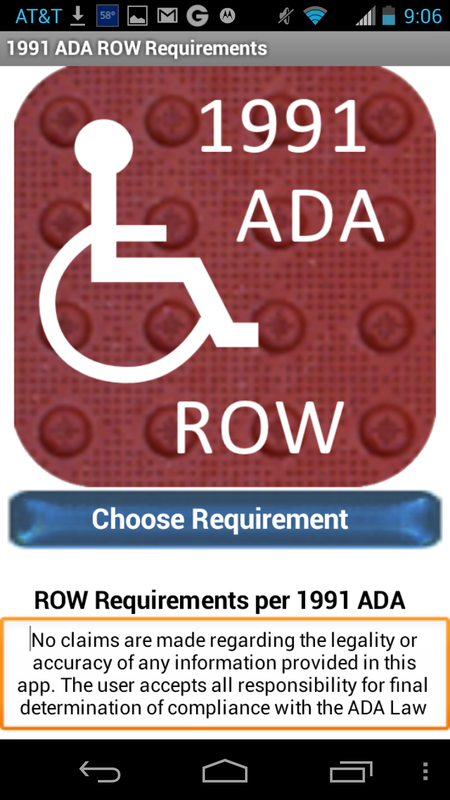 Today marks the 25th anniversay of the signing of the ADA legislation. This milestone is a good time to look around your community and see just how much your governmental agency has accomplished in removing barriers for those who have disabilities. Do you have a transition plan for identifying and removing barriers? When was the last time you inventoried barriers and updated your transition plan? What percentage of barriers in your built environment have been brought into compliance? Is your governmental agency website compliant? Are your public meetings and publications compliant? Have you incorporated accessibility and needs of those who have disabilities into your emergency response plan? For many of us, even after 25 years, we still have a long way to go to achieve compliance. This is particularly true for those of us addressing facilities within the right of way. As most are aware, much of the reason for this is due to the lack of clear guidance and direction specifically addressing the right of way. Fortunately the Access Board is working on finalizing Proposed Guidelines for Pedestrian Facilities in the Public Right-of-Way or PROWAG, and when it is finally approved, much of the confusion over requirements will be settled. Are you aware that Federal law requires the installation of curb ramps or other modifications when a highway project alters a roadway? 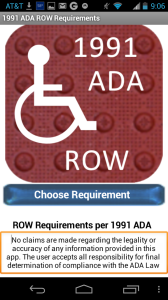 To learn more visit the new information module and watch the short video below (4:45) entitled “Americans with Disabilities Act (ADA) Requirements for Resurfacing Projects”. This new video discusses the types of resurfacing modifications under which the law applies and will be of interest to any Agency that provides routes in the public right-of-way. The U.S. 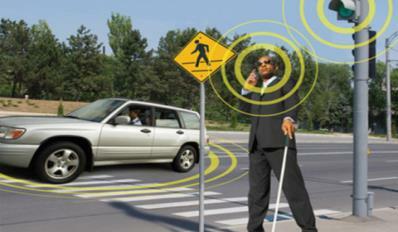 DOT through the FHWA has opened a dialogue on Transportation and Assistive Devices and Technologies. You can visit their Ideascale site to offer your own ideas about how best to make use of technologies to enhance and support mobility for transportation users with disabilities. It's important for all of us in involved in roadway and signal design to remain involved in dialogues like this so that new technologies can be integrated in the most efficient and effective manner. Even if you don't want to comment or offer an idea, it's helpful to read through the ideas and comments to learn what those who use facilities we design really need. And there are a few comments that lead to other resources and tools which might be useful to planners and designers. 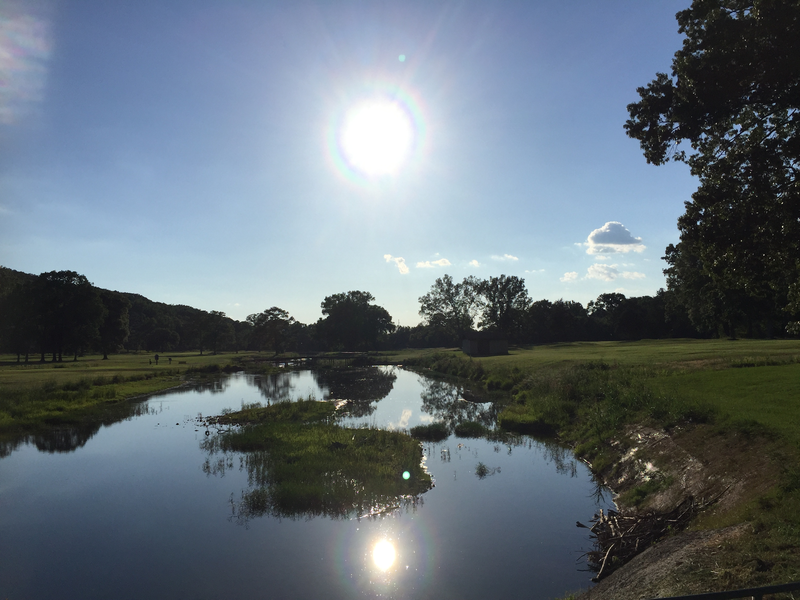 Other than the inability to really hear and understand what is going on from these devices, we are also aware there is concern about the constant noise created in the environment. While this is useful and necessary when needed, is it best to have a device that continues to make noise in the environment even when not needed? Especially when it begins to compete with other signal device sounds in a highly dense, and urbanized area? Before smart phones these were perhaps our only solution and therefore necessary, but now with smart devices, we wondered if it wouldn't be better to have pedestrian signal devices communicate directly with smart phones or devices. The APS could activate only when sensing a device that is programmed to request specific information from the APS such as location of button, path guidance, and area location information. If a path or destination had been programmed, perhaps the APS could even signal to the user which direction to go or if they are on the wrong street. We also talked about installing something in the pavement along both edges of the crosswalk that could communicate with a pedestrian and let them know through vibrations or a pulse they were wandering outside of the crosswalk area. Since exploring these ideas, we have not yet had the chance to discuss it with anyone who has a vision impairment which is why the dialogue is so important. Perhaps there are issues with our ideas we have not considered since we are primarily the designers and not the users of these devices. So I encourage everyone to take just a few minutes to visit the site, read the ideas, submit your own if you have them, add some comments, and work together with everyone to increase the use and mobility of our designs for everyone. We realize that in the near future PROWAG will be finalized and new requirements released so we are also working on developing an app to display those requirements. I'm not sure if we'll get it done before the ruling is finalized, but if so we we might end up releasing it as a draft and then update the content later to agree with the final requirements. If you have any comments or suggestions for the app, feel free to leave them in the comment section or just send us an email!